The water in Malta is too cold to go for long swims during the winter so my mother got me a wetsuit (and related safety gear, which I left in Canada) for Christmas. Now that we are completely settled back in Malta I had the chance to test it out. The locals in Malta stare at you strangely when you wear a short sleeved shirt in the winter (British and German tourists, be warned) so you can imagine the looks I got walking the streets of Malta in my wetsuit and Birkenstocks. The wetsuit I got is fragile and made specifically for distance swimming (1-3 mm thickness for the Mediterranean in the winter, in case you are in the market for one). So I needed to find easy access to the water so I wouldn't tear it on the rough limestone. 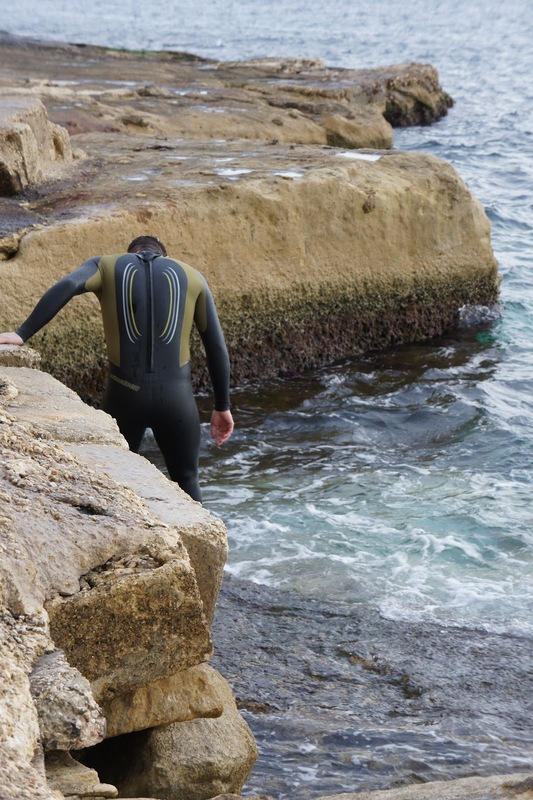 In the summer there are ladders along much of the rocky coastline in Malta for swimmers, but I couldn't find any this winter. I finally located an easy access point in Sliema and took the plunge. After swimming about ten feet I also located some of those missing ladders, at the bottom of the sea. Needless to say, after that find Jess won't let me swim in rough surf. I've never worn a wetsuit for an extended period of time before and it makes me feel like a floaty rubbery seal. Swimming feels different in a wetsuit as the air pockets increase your buoyancy. The water temperature is about 16 degrees Celsius in the Med right now so it's still cold on my hands, feet and head but otherwise I was a comfortable temperature and I didn't have to use the yellow furnace (that I've heard wetsuit wearers use) to stay warm. Jess was glad.